Aerial photographs are not maps. They are single-point perspective views of the Earth's surface, whereas maps are orthogonal representations of the surface. Sizes, shapes, and positions of objects are distorted in aerial photographs. However, aerial photographs can be used to construct maps and to accurately measure distances, heights and elevations. The use of photography for accurate measurement is called photogrammetry. Aerial photographs are classified in three types, depending on orientation of the picture. The tilt of the camera lens relative to the horizon is called depression angle. Vertical airphoto – View straight down, depression angle 85° to 90°. Low-oblique vantage – Side view, horizon is not visible, depression angle typically 20-85°. High-oblique vantage – Side view, horizon is visible, depression angle typically less than 20°. Vertical, low- and high-oblique kite aerial photographs. Lake Kahola, Kansas, © J.S. Aber. H = flying height above the ground. The scale of a vertical aerial photograph can be calculated in two ways. In either case, the units of measurement must be the same. The scale depends on the average height above the ground. In rugged terrain, photo scale varies because of large height differences within the photograph. Likewise oblique or non-vertical photos also display scale variations, so they are rarely utilized for photogrammetry. Because of the single-point perspective nature of photography, objects toward the edge of a photograph suffer relief displacement. This is most noticable, because tall objects appear to lean away from the photo center. Conversely low objects are displaced toward the center. Relief displacement is minimal near the photo center and becomes extreme at the photo edge. This allows for a "side view" of tall objects near the edge of the photo. The height of a tall object may be calculated from its relief displacement, and the height of tall objects may also be determined from measurements of shadows. Near-vertical kite aerial photograph. Notice different view of trees near scene center in comparison to trees at far right. This is an example of relief displacement. The bright spot on ground to left (red arrow) is an example of the opposition effect--the position in direct alignment with the sun and camera. Next to the opposition point is a dark spot (blue arrow). This is the shadow of the kite that lifted the camera. Cucharas Pass, Colorado; photo date 6/00, © J.S. Aber. Principal point: Geometric center of photograph. Literally the point on the ground in line with axis of camera lens. Fiducial marks: Marks on the photograph margins used to locate principal point in photo. Conjugate principal point: Point in overlapping photo that is equivalent to principal point of adjacent photograph. Photo base: Distance between principal point and conjugate principal point measured on a single photograph. Ground (air) base: Ground (air) distance between principal points of overlapping photographs. Parallax: Apparent shift in relative positions of objects when viewed (photographed) from different vantage points. Parallax is the basis of stereoscopic vision. The human eyes, spaced a few cm apart, each see the world from slightly different vantage points. This slight difference introduces a parallax that facilitates depth perception. In aerial photography, two vertical photographs of the same ground area may be offset by considerable distance. When the two photos are viewed through a stereoscope, an enhanced depth perception is created in which the heights and slopes of objects are greatly exaggerated. Many types of stereoscopes are in use for this kind of work. Vertical, stereopair, kite aerial photographs taken over cemetery, Emporia, Kansas. Click on the small image to see full-sized version (129 kb). Photos © J.S. Aber. Oblique, stereopair, kite aerial photographs taken over residential neighborhood, Emporia, Kansas. Click on the small image to see full-sized version (144 kb). Photos © J.S. Aber. Sokkia mirror stereoscope for SFAP. This stereoscope is the ideal size for viewing 4x6-inch (10x15-cm) prints. Taken from ASC Scientific. The calculation of approximate heights and elevations using parallax measurements can be done quickly and easily with the formulas given below. These calculations depend upon the assumptions that ground principal points in each photo are at about the same elevation and that the bases of objects being measured are also at about the same elevation. Two formulas may be used. Example of height calculation: p = 2 mm, H = 3840 m, b = 65 mm, B = 998 m, f = 250 mm (taken from Topcon stereoscope manual). 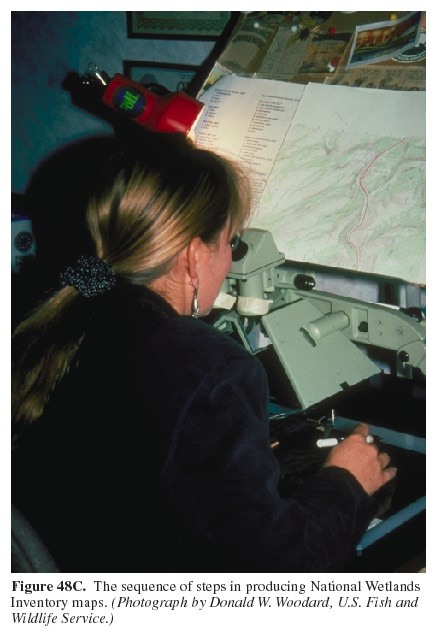 Use of a mirror stereoscope for photo-interpretation purposes (U.S. Geological Survey). Aerial photography in stereo 3D from Denmark. Concepts of aerial photography from Canada. ES 555 © J.S. Aber (2014).